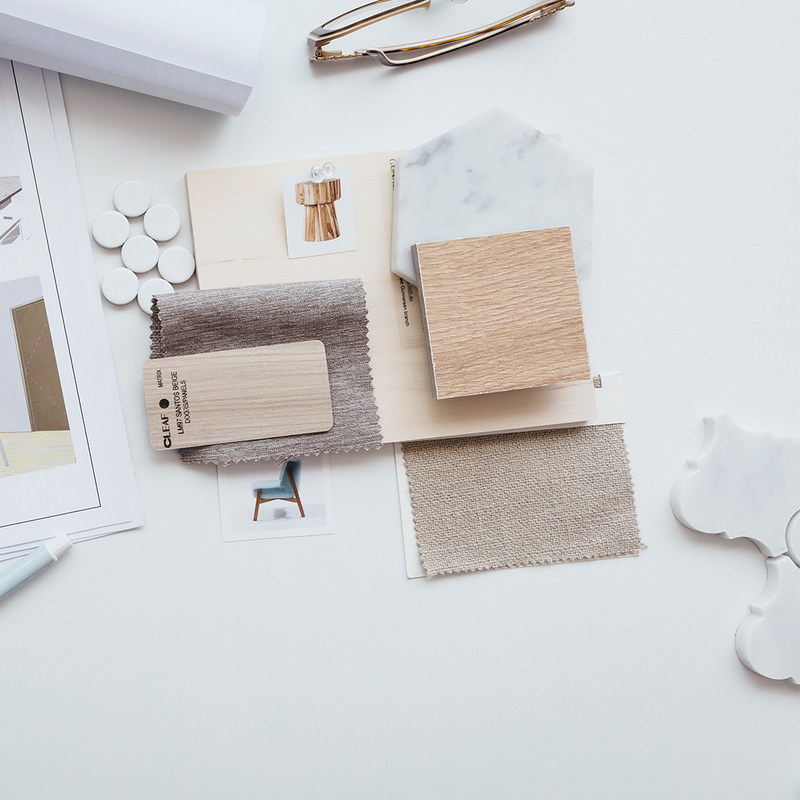 When considering your Bathroom Renovations Perth, you need to decide what’s being replaced and what can be salvaged especially if you’re on a tight budget. 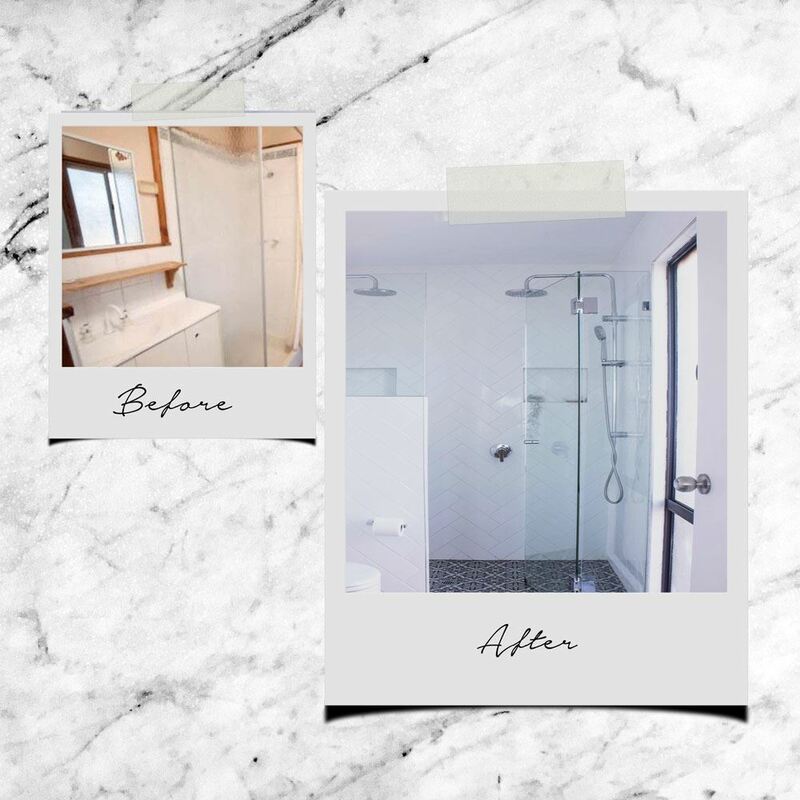 This particular renovation needed a full demo, we needed to move walls and plumbing to change the orientation of the shower and the toilet and new ceiling. Look at your existing ceiling, can you get away with just a re-paint to freshen up? Also look at the existing window, to save on costs with this renovation, we just re-sprayed the window frames in a crisp black. I wish we had the budget to replace the glazing with new obscure glazing. Later I installed a roman style blind, to hide as much of the glazing as possible. Design sometimes needs to be about compromise. The reason is mainly too much stress – what I failed to realise is you need a lot of time if you want to do everything yourself. I’m too impatient and want it done asap. But with limited funds, we thought we would give it a go. 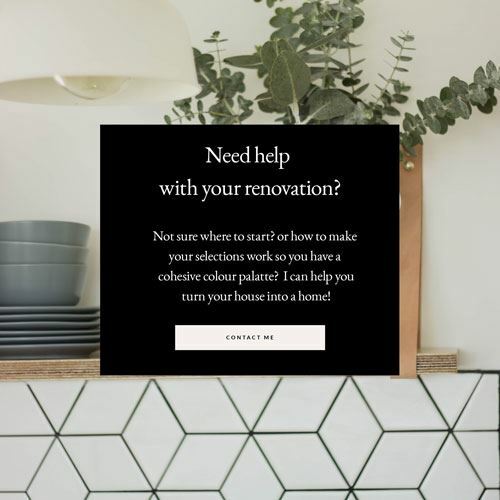 If you want to read more about what I learned about doing a full home live in renovation, I wrote a blog post over here the mistakes made & how to avoid them. Bathroom Renovations Perth; needed a total gut out and believe it or not the new ensuite is actually smaller in width, as I needed space to add in a scullery on the other side of the wall. This was a renovation on a tight budget, but I really wanted full height tiling. Hello, white subway tiles! These tiles are so affordable now, probably because they are so popular. 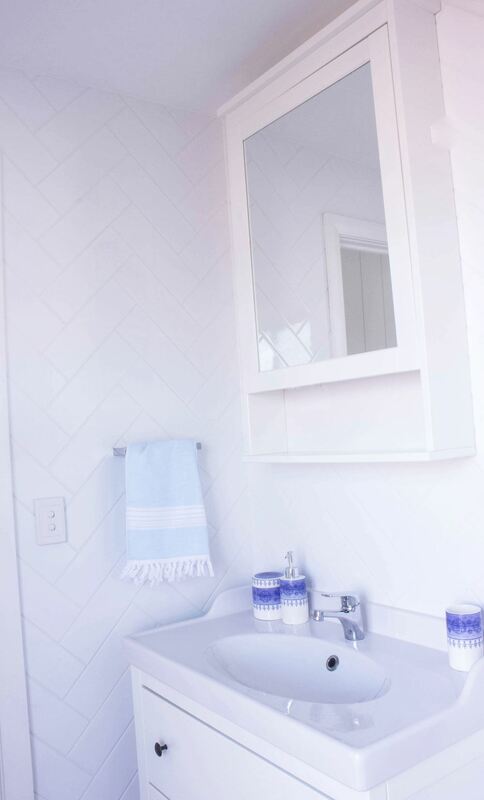 Laying the tiles in a herringbone pattern really lifts the space and adds to that luxe feel. But it did come at a cost in extra time~ it took twice as long to get the tiles right & all those cuts needed. I still think it’s worth it. 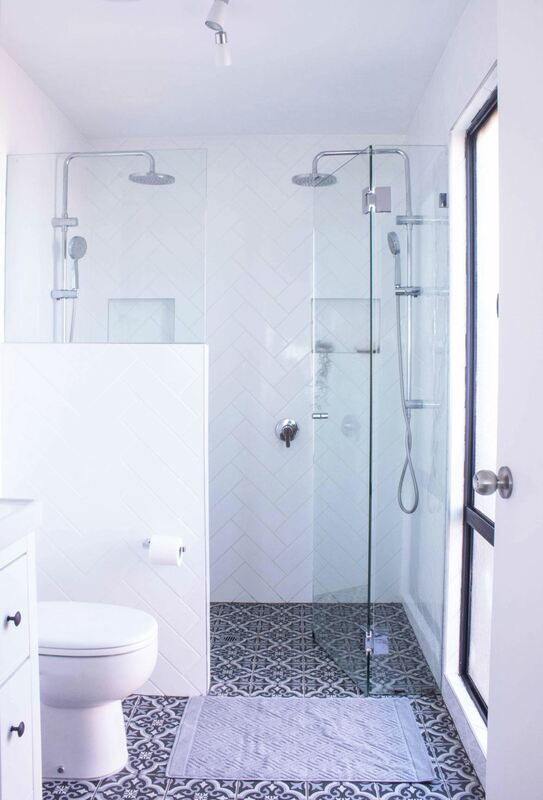 The feature floor tiles were sourced from the local tile store, in keeping with a coastal feel within the rest of the home. The vanity chosen is the Hemnes/ Rattviken wash stand from Ikea, I selected more of a classic/ vintage look basin storage unit, which adds some real world charm. I also needed drawers in the bathroom, so there’s plenty of space for hairdryers, shampoo bottles and various other bathroom items. I don’t think I could ever go back to vanity cupboards again. I’m really pleased how far this Ensuite has come, it feels so light and bright and in the morning there’s so much gorgeous sunlight streaming through. In fact, sometimes I think oh I’ll just wash my face quickly before rushing off doing something to keep the kids busy. 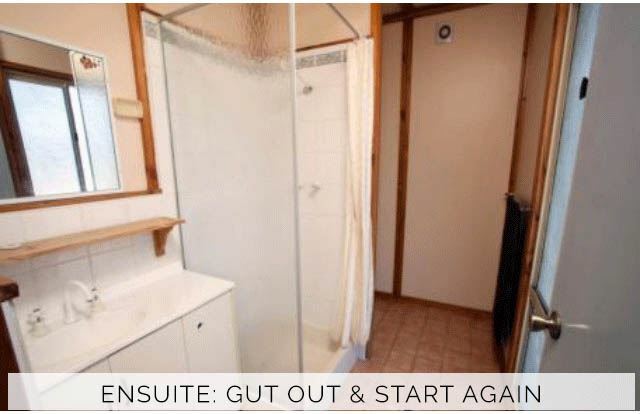 But this ensuite seriously has other ideas. It’s telling me ‘take my time’ enjoy a shower and fill up on some ‘me time’. It’s simply a joy to spend time here. 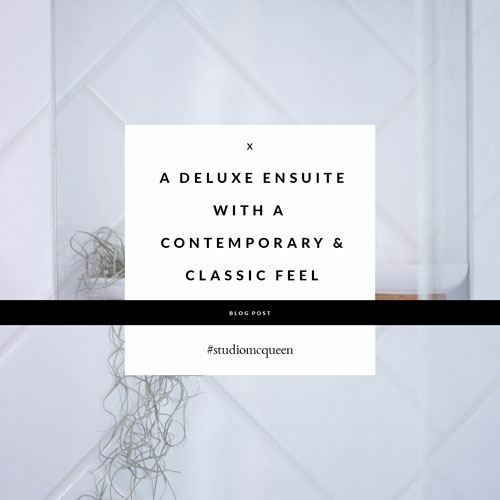 Are you thinking of renovating your Ensuite/ bathroom or your kitchen? 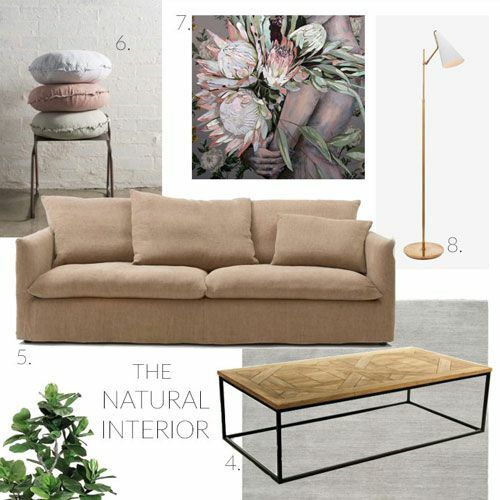 I can help, we discuss your needs I come up with a plan layout based on your budget, show you a 3D view, we select finishes & selections and all those small details that create a contemporary space but with a classic feel that won’t date in a year. Then I can bring my trades team in, deal with any questions that come up with install and issues that may come up. I deliver a high level of personal service throughout the design process & build process. 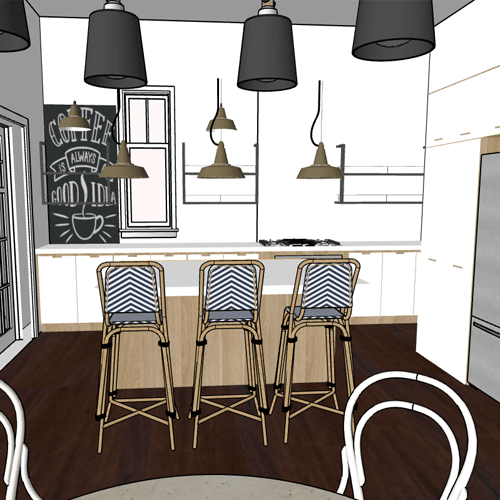 I believe the emotional journey of our clients from concept to completion is just as critical as the design itself! Nice Content idea. i think you should cover more this type of you project before and after . Thanks Handyman! I’ll keep that in mind. Sometimes I just forget to get ‘before’ images. haha.